As I was doing my quick-mile run yesterday, something felt off. Granted, it felt wonderful to be running when I've been limited to zero-impact activities for the past few months, but with each step I took I noticed every single little pain or discomfort. And it scared me. A flood of fears filled my mind as I ran on at 5 miles per hour with a slight incline (because I wanted to simulate outdoor running). What if I'm running too soon? What if I'm pushing too hard? What if this is the fastest I will ever run from now on? 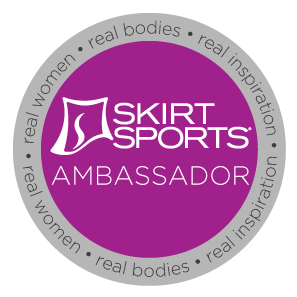 What if I'm aggravating my knee injury and it only worsens? What if I get injured again? What if I can never run the same ever again? Doubt after doubt race through my head almost as fast as my cadence as the fear attempts to paralyze me--attempts to stop me. But I push through that fear and complete my run. I was far more tired stepping off the treadmill yesterday than the day before, and it's not due to the back-to-back training. Fear literally drained my energy, stealing away positivity in its wake. How many times do we allow fear to so consume us that it seems there is no happiness or even just calm left in the world? Why do we let this happen? It takes consistent practice to start living by faith when fear has plagued life for so long. Pray for the courage to cast fear away and pray for help growing the seed of faith. Be specific in prayer. Ask for faith in yourself and in your Lord. Ask for the faith that you will "run, and not be weary...walk, and not faint" (Isaiah:40:31), that you will eat healthy things while turning down sweets. Ask even for the faith that you will find happiness, strength, and peace in all things. Repeat often positive mantras during those times when fear is creeping upon you. The more you think uplifting thoughts and the more you say them aloud, even just to yourself, the more you will believe them and have faith in them. This also works the same in the opposite direction. The more you succumb to fear and doubt, the more you think on them, the more likely it will be that these negative events will unfold and consume you. 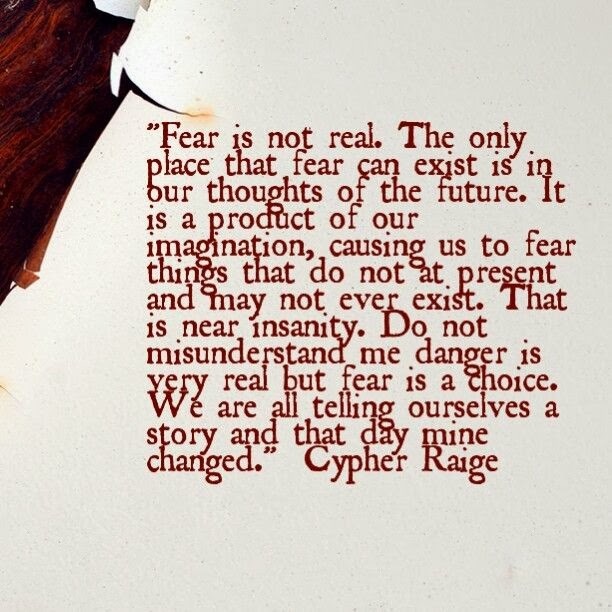 Fear is not real! Fear is a choice! Live by faith, not by fear! 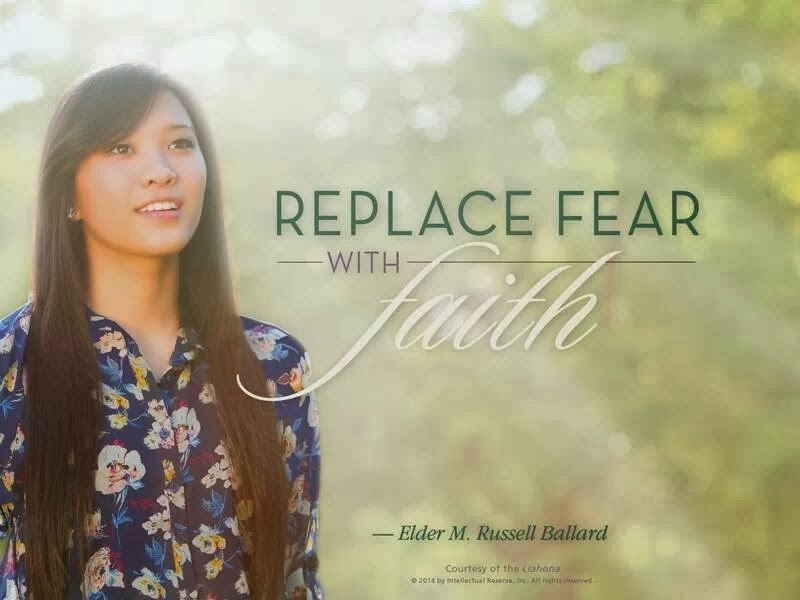 Today as I run my 1-mile, I will cast away any fears and I will replace them with faith. Faith that I will run and not be injured, that I will soon be running faster and farther, and that I will be 100% healed. Already I've eaten healthfully today and I have faith that I will continue this trend. 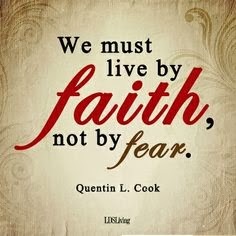 I think my new mantra will be "Live by faith, not by fear." I'm always in need of a good dose of positivity. What are the mantras you live or run by? I'd love to apply them myself. My mediation teacher is writing a book and asked me to share my story on fear and then she asked if she could post it to her blog too. SO here is my story on fear on her blog. http://progressiveprophetess.blogspot.com/2014/01/end-fear-detour-jennifers-story.html It is true though that the more we think positive and try hard to do what God wants the easier it is not to be fearful. Thanks for sharing! You have such a powerful testimony and you are filled with so much strength. Do you take a meditation class in town? It sounds like an effective tool to use in overcoming trials. Beautifully put! You are a great writer. Have you read the talk by a BYU professor called Fear and Faith? Its my absolute favorite. Well said, Rachel, and something I needed to hear. One of my favorite quotes goes something like this: "Work as though everything depends upon you, pray as though everything depends upon God." It gives me comfort to know that once I've done all I can do, the rest is in God's hands. BTW, you look AMAZING and you are in AMAZING shape. I think you've reached your goals tenfold!! Good job!! Thank you! I think much of the time I tend to be my worst critic. I just need to take a step back and take in everything in proper perspective.